The Norns are female deities in Norse mythology who govern fate. Their names are Urd (what has been), Verdandi (what is) and Skuld (what is to come). Skuld is also the name of a Valkyrie. The Norns are at the base of the ash tree Yggdrasil (or, according to some versions, above the Bifröst bridge). They spin threads and weave the tapestry of fates. Each person's life is a thread in their loom. The length of the thread is the length of the person's life. Even the gods have their threads and are therefore not immortal, though the Norns hide the strings from the gods. So everything is set out beforehand. There is no luck, there is no randomness, everything is determined by destiny. The Greeks called deities similar to the Norns Moirae, and the Romans called them Parcae. The three Norns appear at the beginning of Richard Wagner's opera Götterdämmerung and foretell the downfall of the gods when a thread of fate breaks. 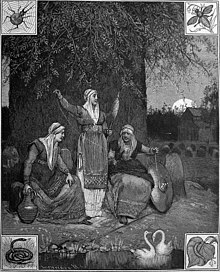 Wikimedia Commons has media related to Norns. This page was last changed on 3 November 2013, at 00:39.